Visiting Atlanta on a budget? We recommend buying the Atlanta CityPASS. This deal will save you 40% on admission to Atlanta’s top attractions. We recently got to explore Atlanta thanks to a house sit that we had there. We had only ever been to Atlanta’s airport so we were excited to spend some time getting to know the area and seeing some of Atlanta’s top attractions (getting to explore new cities is one of the things we love most about house sitting). Once we arrived, we were very excited to learn that there was an Atlanta CityPASS. Believe it or not, we travel on a very tight budget. We’re often asked how we afford to travel, and we’re able to do so because we take advantage of good deals whenever possible. 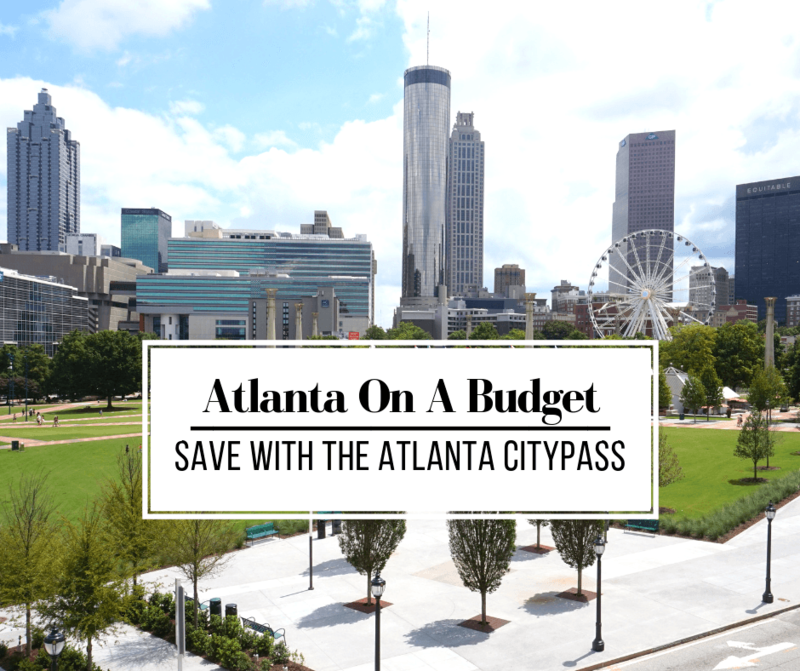 We think the Atlanta CityPASS is one of those good deals. The Atlanta CityPASS is a booklet that contains tickets to the top attractions in Atlanta. You save a lot of money by buying the tickets as a package and it’s valid for 9 consecutive days starting with the first day of use. You can buy the Atlanta CityPASS either online at this website or at one of the participating attractions. With the Atlanta CityPASS, you can visit 5 of the 7 participating attractions. You can visit them in any order that you want and at your own pace since you have 9 days to use your pass. If you’d like to visit all 7, there are coupons inside the booklet that give you discounts for the remaining 2 attractions. Obviously, you’re trying to do Atlanta on a budget, so the cost of the Atlanta CityPASS is probably one of the first things you wondered about. Well, it’s $76 for adults and $61 for children (plus tax). By buying the pass you end up saving about 40%. We added up the cost of admission for 1 adult for the 5 places we went and if we’d done it on our own the cost would have been $126. That’s a savings of $50. We’re sure you can think of better ways to spend $50! This place is awesome! There are exhibits where you can learn about the history of Coca-Cola, see how it is bottled, take a picture with the famous Coca-Cola Polar Bear, and even take a look at the vault where the secret formula for Coca-Cola is kept. Our favorite exhibit, though, was the tasting room where you can taste over 100 Coca-Cola beverages from around the world! The vault that holds the secret formula! The Georgia Aquarium has been voted the Top Aquarium in the US by TripAdvisor and it now also has our vote for best aquarium we’ve ever been to! 😉 As the second largest aquarium in the world, they have amazing displays including a 6.3 million gallon tank of salt water that has whale sharks!! Selfie with a ship captain on stilts! Seeing these whale sharks was absolutely amazing! First of all, Zoo Atlanta has giant pandas. And over 1,500 other animals. Plus fun activities, presentations, a petting zoo, and train rides. Make sure you grab a zoo map and check the times for keeper talks, feedings, and training demonstrations. For an additional cost, you can try out their new Treetop Trail aerial playground. It has rope ladders, bridges, and nets. With this behind-the-scenes tour, visitors learn all about the world headquarters of CNN. A guide will take you around for just under an hour and you can see where research is done, learn how a broadcast is produced, and possibly even see a live broadcast! When you first get there, make sure you show your CityPASS at the box office to get a specific entry time. Tours start every 20 minutes. Once your tour starts, you’ll go up the world’s longest freestanding escalator. There are no photos allowed while on the tour, but you do get one photo op of a recreated studio at the beginning of the tour. About to start our tour! Even if you’re not a die hard football fan, the College Football Hall of Fame is super fun because it is so interactive! You’re given a fully interactive All-Access Pass that you customize with your name and favorite college football team. Then as you go to the various exhibits, you’ll get personalized interactions and it saves it all so you can access it once you get home. There’s also an obstacle course, an indoor half-football field, and really cool exhibits. One of our favorite exhibits was all about the history of tailgating. There are a lot of fun things to do in Atlanta, but the cost of visiting a lot of attractions can add up. That’s why we believe the Atlanta CityPASS is such a great deal if you’re trying to visit Atlanta on a budget. It’s convenient and saves you time and money. It’s a win win! I really want to go to that aquarium! Great job on the video Vicky! I hope you explore this medium more in the future. Agreed on house sitting Vicky. Really takes us to places we may not explore otherwise. We landed a Brooklyn house sit a few hours ago, for around Thanksgiving. Sitting now in Connecticut, we have a Queens NYC 2 weeks from now and a NYC Upper East Side sit in mid November. Gotta love it. Those are great house sits that you have coming up! Remember to bundle up! It has been ages since we have been to Atlanta. Maybe because the last time I was there was to get my ankle put in a cast after a skydiving accident! But you have provided me with some good reasons to go back! We too have had mixed success with city cards. Glad this one worked out well for you guys. The aquarium looks like a stop for us. The whale sharks did look amazing. Maybe a stop at Coca Cola world would be on our plans too. Will definitely check out the Atlanta City Card if we visit. It is more and more common for major cities to offer these city passes, and you’re right — they can be a great deal. It is important to first determine what you really want to do, though, and be sure buying a pass is the right thing for you. I know we sometimes are only able to stay in a city one or two days and we haven’t had time to do enough of the attractions to make the pass worth buying. Your itinerary looks like a lot of fun, though! House sitting seems a really great way of exploring a new city when you are on a budget. Likewise the Atlanta CityPASS looks like a money-saver for those who do want to visit 5 of the attractions covered. For me, the world of coca cola would be a must! City Passes are always a good bargain! I would have loved to visit the Coca Cola museum, not because I like to drink it but because it would be intriguing to learn about their journey through so many years. Zoos and aquariums do not interest me much, maybe because I am not find of seeing animals in captivity! I have never been to Atlanta but it seems to make for a good weekend getaway! It’s good to know you can save 40% on admission to Atlanta’s top attractions with the pass. The Coca Cola attraction and CNN Studio tour would be my pick. But they all look interesting. Didn’t know Atlanta had so many touristy things to see. Wow! This will be fun with kids, too especially the Aquairium and the Coca Cola World! I’m so happy reading this post, now I’m more inspired to get a US Visa! Big thanks! Fantastic list of budget-friendly spots! Thanks for this!